Tez Provides a general-purpose, highly customizable framework that creates simplifies data-processing tasks across both small scale (low-latency) and large-scale (high throughput) workloads in Hadoop. Apache Drill is an open-source software framework that supports data-intensive distributed applications for interactive analysis of large-scale datasets. Drill is the open source version of Google's Dremel system which is available as an IaaS service called Google BigQuery. The Kiji Project is a modular, open-source framework that enables developers and analysts to collect, analyze and use data in real-time applications. 1. Caches - Refills and invalidation messages need to be sent to each cache so they stay in sync with their local database and consistent with each other. 2. Services - Services such as Graph Search that build specialized social indexes need to remain current and receive updates to the underlying data. 3. 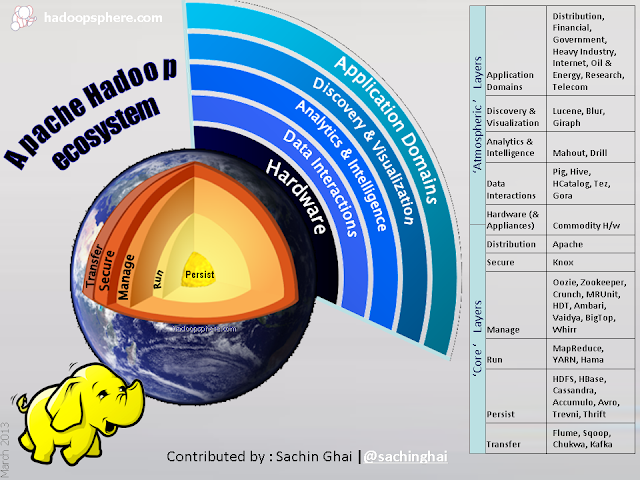 Data warehouse - The Data warehouses and bulk processing systems (Hadoop, Hbase, Hive, Oracle) receive streaming, real-time updates instead of relying on periodic database dumps. RecordBreaker is a project that automatically turns your text-formatted data (logs, sensor readings, etc) into structured Avro data, without any need to write parsers or extractors. Its goal is to dramatically reduce the time spent preparing data for analysis, enabling more time for the analysis itself. Azkaban is a batch workflow job scheduler created at LinkedIn to run their Hadoop Jobs.